You see, those links are articles here on my site that give you really critical information if you are thinking of starting a business. I invite you to spend some time just looking at things already here to help you start your business. I am also going to encourage you to follow the information on how to build your website. 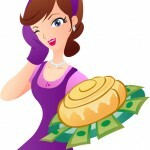 It might seem funny that a website that talks about how to make money baking would cover using WordPress. I have to tell you that the purpose of my site is about how to make money from home doing something you enjoy. It about running a business, because that is how you make money. Successful businesses have websites. Even more important is the fact that a website lends credibility to home based businesses. That is a lead into the real purpose of my blog today. 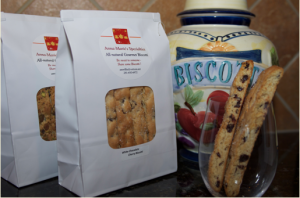 I want to share a story about a woman in Texas who has started a business baking at home. She is doing a great job. Her name is Anna-Marie Williams. When her state passed the Cottage food laws, she took advantage of them to make a long time dream come true. She was well known for her great baking skills, but instead of just jumping in, she studied her competition and zeroed in on a niche that offered her the best opportunity. That is called finding your target market in business. She realized that there is a lot of competition. There were cupcake shops everywhere she looked. Cakes are not her thing, and the cookie market is highly competitive. 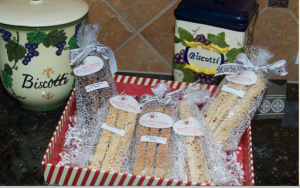 As she looked closely at her recipe box, she began to think about biscotti. She had grown up in New York where it was really popular. She started out selling it mostly to family and friends. Then she branched out and got a car dealership on board. That is a great move because that account represents repeat business, and that is the lifeblood of any business. Customers who have a standing order are the Holy Grail in business. You don’t want to have just one, because you can’t put all your eggs in one basket, but a great customer along with numbers of other customers does wonders for your business. Anna-Marie kept doing her homework. 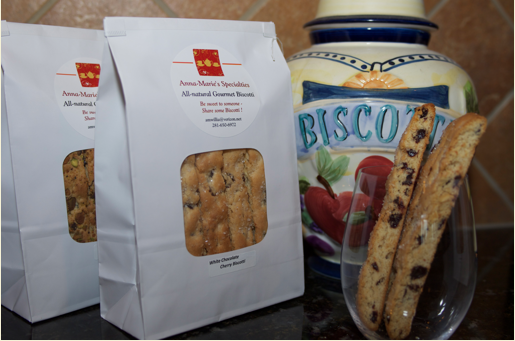 She realized that biscotti lends itself well to the gift market. It has a longer shelf life than other baked goods. She knew that presentation was really important. Distinctive packaging allows you to charge premium prices. 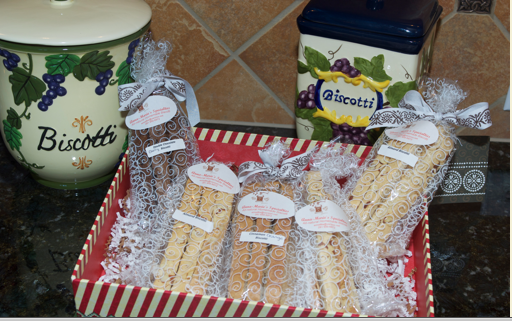 This is an example from her website of her biscotti gifts. The packaging and presentation make a huge difference! In addition to the packaging, the attractive display for her website is great! She has gone above and beyond the Cottage Food laws with her labeling. She has invested in some professionally made labels and that lends even more credibility to her product. The great news is that with a little work, you can find companies that provide elegant packaging that will set you apart. One supplier I used for the gift packaging for the gift basket division of my company was Nashville Wraps. They sell lots of bags and boxes. You can find FDA approved food grade packaging there that is distinctive. They also have labels. I know that this is an investment. It is, but you do have to spend some money to get your business off the ground. Making these investments in the beginning will allow you to set yourself apart. To be sure, there are many other suppliers out there, I just want to make you aware that little things can make a big difference. Anna-Marie is running her business from her home kitchen. She is doing lots of things right. She did her market research and found a niche market she could thrive in. She started getting the word out through family and friends. She stepped outside that safe zone and went and found the car dealership to sell her products to – repeat business – that gives her income she can count on each week. She dug deeper and realized that her product lends itself well to the gift market as well. That made her realize the importance of attractive packaging and presentation. All that is key, but even more important was expanding her reach. She did that with her website. Building her website proves to the world that she has a legitimate business. By looking at her site, you would never know that she does not have an expensive brick and mortar store. The combination of the great product, the attractive packaging, the eye for display, the good photography, the market research, the willingness to explore the market and think “outside the box” so to speak is the recipe to success for her business. I would invite you to visit her website, she has done a great job. I don’t know Anna Maire, but I did contact her to get her permission to write about her. She wants to encourage other bakers to go for it if they live in a state with Cottage Food laws. It is possible to make this work for you. I ran a home based baking business for a long time, but I did not have the opportunity to legally bake at home until I invested in adding a licensed commercial kitchen to our home. That can be difficult, and does require an investment. Now the laws allow you to avoid that expense. Having a website puts a real face on your business. You have an amazing opportunity to run a home based business, avoid a lot of expense, and have a dream come true! You just need to follow the steps to do it right. All these things are doable but it takes time and research. If you want to get up and running faster, I can help you with that. 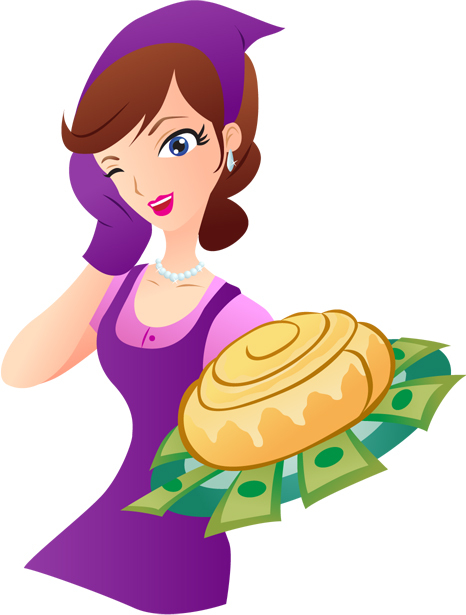 I have a lot of experience running a baking business from home and I offer business coaching. I will brag a bit and say that not many people have licensed commercial kitchens in their homes and can speak from years of experience. With the passage of Cottage Food laws, many people now can open home based baking businesses and I can help them get up and running faster. I would love to help you too. Please click on that link and get started today.